A California inmate is suing the state, claiming it hasn’t acted fast enough to keep its prisons in good repair. According to the Los Angeles Times, California has committed $260 million to repair ‘leaking roofs and clear dangerous mold at more than two dozen deteriorating prisons.’ But that quarter-billion investment doesn’t meet expectations. Bringing the state’s jails up to par would run closer to an even $1 billion. The lawsuit, filed by inmate Robert Escareno, provides a disturbing fist-hand look at conditions in state prisons. His allegations have been backed up by other convicts, including Marvin Dominguez, who provided corroborating accounts full of disgusting details. Dominguez claims, among other things, that maggots and mice are common fixtures at some facilities. He says they sometimes fall through the ceiling, dropping onto inmates’ dining tables. The same faulty infrastructure that allows rodents and insects to infiltrate also means that bird droppings and rain make their way through roof, streaking walls and dampening floors. Recounting the suit’s specifics, the Los Angeles Times reports that mice ‘twice fell onto a dining table and scurried into a dishwashing area in April 2018.’ Dominguez, who eats twice a day at the California Substance Abuse Treatment Facility and State Prison in Corcoran, claims he’s also found writhing maggots in his lunch tray. 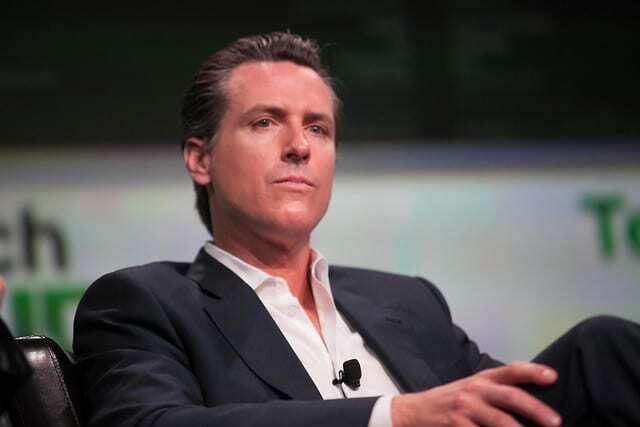 A 2013 image of current California Gov.–then Attorney General–Gavin Newsom. Newsom has dedicated some funds to renovating state prisons. Recently, he garnered some controversy after granting reprieves to all of the state’s death row prisoners. Image via Flickr/user:JD Lasica. (CCA-BY-2.0). When he tried to complain, a guard advised Dominguez to try sitting at another table. Escareno, for his part, says he’s had to eat in dining halls decorated with bird dung. Combined with mold and an assortment of other organic contaminants, the inmate says he has a hard time controlling his allergies. Photographs republished by the Associated Press align with inmates’ claims. Ceiling tiles appear water-damaged, broken in spots and completely absent in others. And other pictures, showing roofing material at a California prison, evidence poor upkeep—corrugated metal, covered in rust and half-buried in rocks. Corcoran Prison Lt. Michael Owens, testifying on behalf of the state, blamed part of the problem on inmates. According to Owens, Corcoran suffers from rainwater leaks that break down and destroy interior ceiling tiles. The prison no longer replaces them. But inmates, alleges Owens, make it even worse. The lieutenant claims that some convicts will toss food into Corcoran’s ventilation system, attracting flies and their offspring. Owen testified that he’d tried to remedy the problem by making inmates bleach the walls. However, California officials do seem to recognize that system needs fixing, even if it’s sometimes made worse by inmates themselves.